Natto, the wonderful Japanese fermented soybeans, can become the special ingredient for salads. 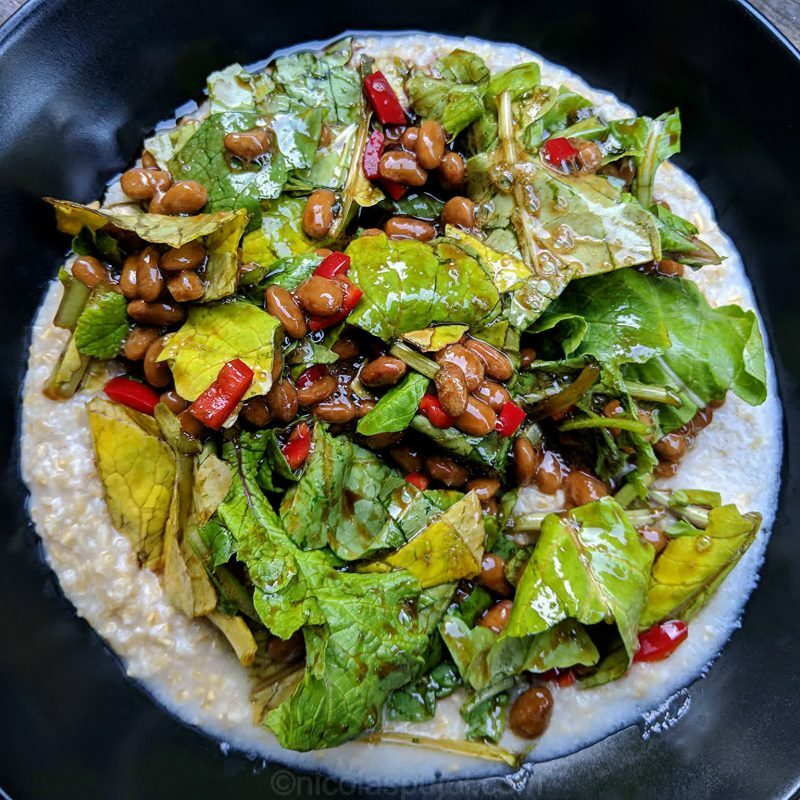 This natto and radish greens salad on a bed of oatmeal provides a filling dish, using fresh red pepper, balsamic vinegar, and no added oil. It is no secret that I love natto. While I don’t eat it every day or even every week — everything in balance — when our local store Uwajimaya carries fresh packs of it, I often buy a few for the occasion. 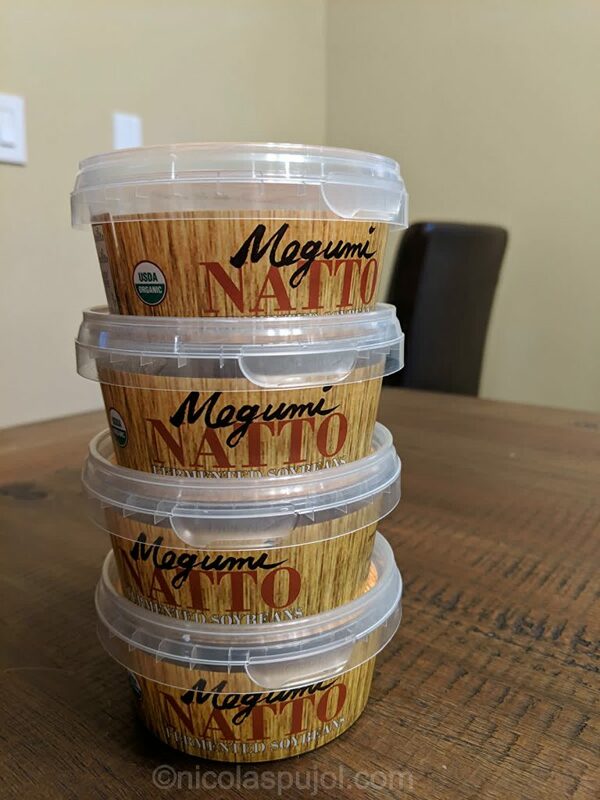 Frozen natto is fine too, but the fact of not having to microwave or wait for the frozen beans to thaw adds convenience to the process. As much as natto is plant-based and a strong source of vitamins, like vitamin K, it does naturally contain some fat, almost 20 grams per cup. For one pack of natto (3 oz), the estimate states about 10 g of fat. This recipe has no added oil, but be aware that many ingredients contain some fats naturally, and natto is one of them. I also love not to waste good ingredients. Last night Layla and I made a veggie aioli platter, which included radishes. I kept the greens for future use by putting them in a bowl in the fridge and covering them with plastic wrap. Today, these greens became the first ingredient for food pairing with natto. The rest of the salad is built around it. Just like rice and natto make natural matches, swapping rice for oatmeal allows for quick carbs cooking (10 minutes or less) and an easier portion control. In other words, it’s easier to make oatmeal for one or two people than it is to make rice for the same amount of people, just because oatmeal is so much faster. I think it’s important to mix the natto with the greens and the sauce so they do not remain as one sticky block of beans, as is often the case. Mixing them in distributes their flavor and makes the dish more visually appealing. 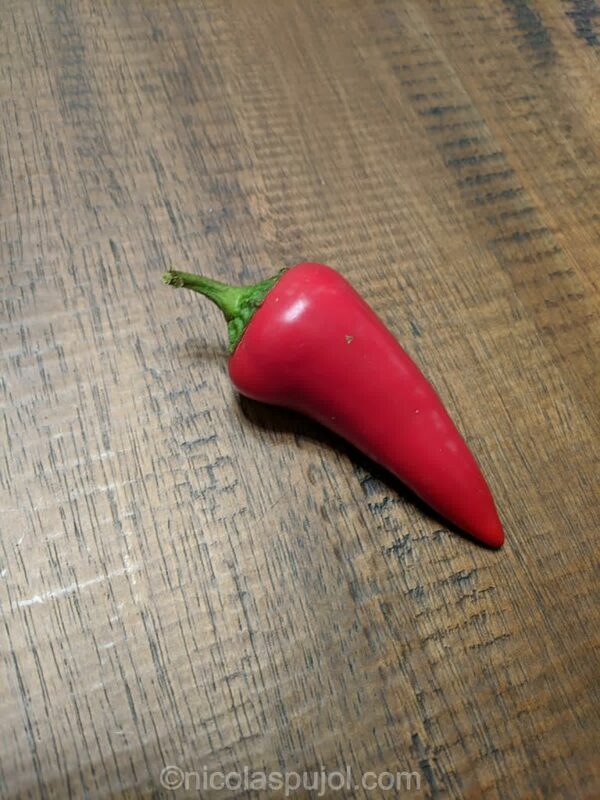 The red pepper I used was quite mild. 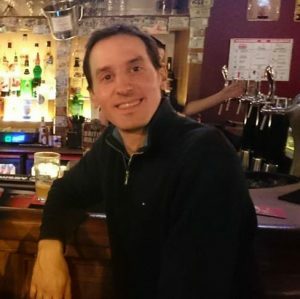 Sometimes they are hotter, it is a bit of a random draw every time. It felt satisfying to add extra hot sauce on top and French mustard on the side. 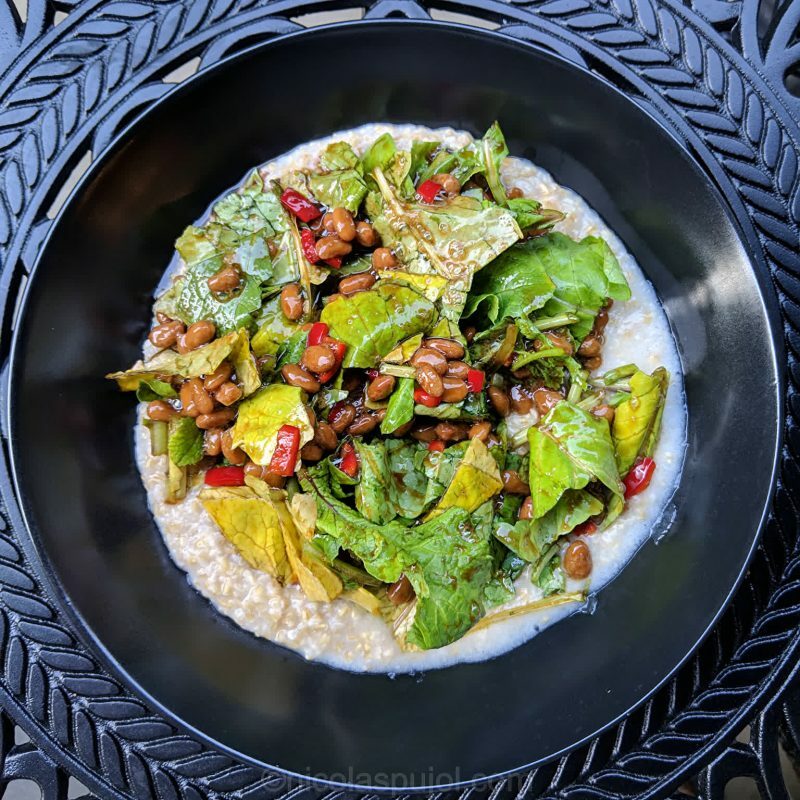 This natto and radish greens salad on a bed of oatmeal provides a filling dish, using fresh red pepper, balsamic vinegar, and no oil. In the meantime, thoroughly rinse the radish greens, then dry them and chop them. Rinse the hot pepper, remove seeds inside, tail, and finely cut it. Combine hot pepper with vinegar in a small bowl. then add the natto to the greens and pour the vinegar/hot pepper combo on top. Mix well. 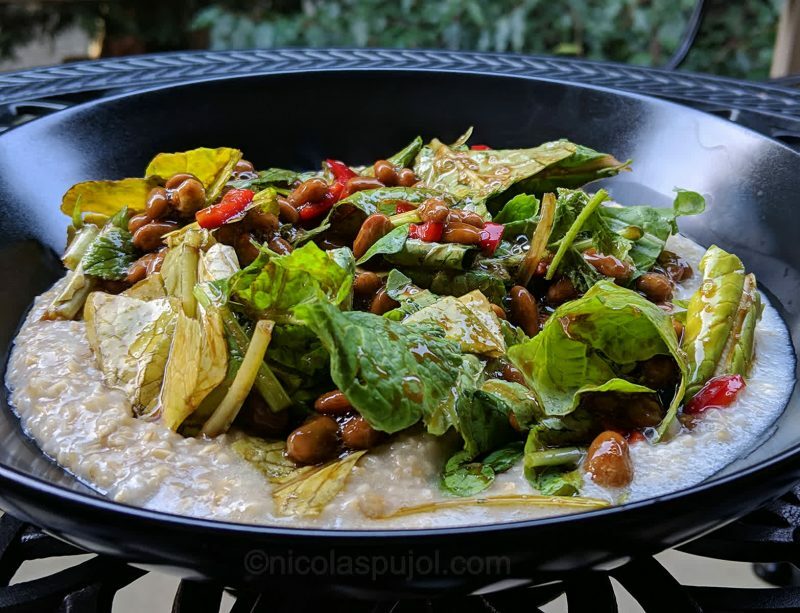 In a deep plate, for example, a soup plate, pour the cooked oats in as a base, then add the salad mix on top, uniformly. Serve immediately and raise the flavor with a side of French mustard, or by sprinkling hot sauce (e.g. Tabasco) over.